A note about using canned coconut milk: First, make sure you’re using coconut milk and not coconut cream. Use a brand according to your personal preference if you already have one. I like to use Trader Joe’s canned light coconut milk because it doesn’t contain additives, has very little sugar, and doesn’t have a strong (almost fake) coconut taste that reminds you of sunscreen and being on the beach like some of the other brands I’ve tried. And it’s not expensive, either—I pay 99 cents per can here in California. One-third of a cup contains 4 grams of fat, 50 calories and 2 grams of sugar. If you like to use homemade coconut milk, that’s perfectly fine to substitute; but since it tends to be thinner, you may want to add some shredded coconut to help with texture and taste so it isn’t too light or thin. 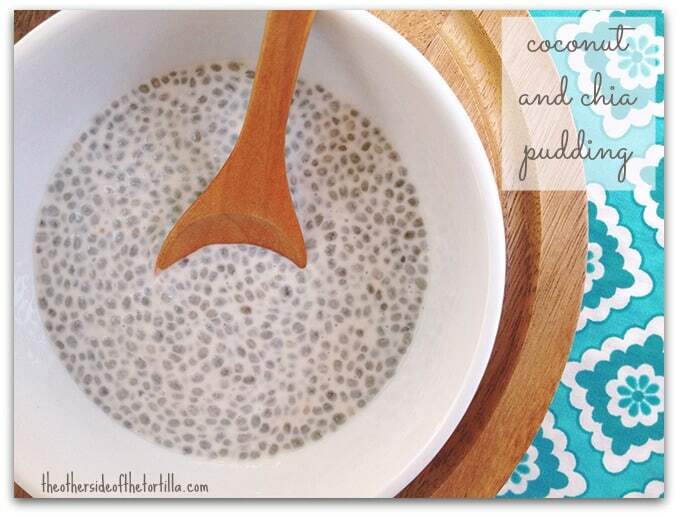 A simple Mexican dessert with only three ingredients: chia seeds, coconut milk and sugar. This recipe is dairy-free, gluten-free and vegan-friendly. Pour 1 can of light coconut milk into a glass jar that holds at least 17 ounces. 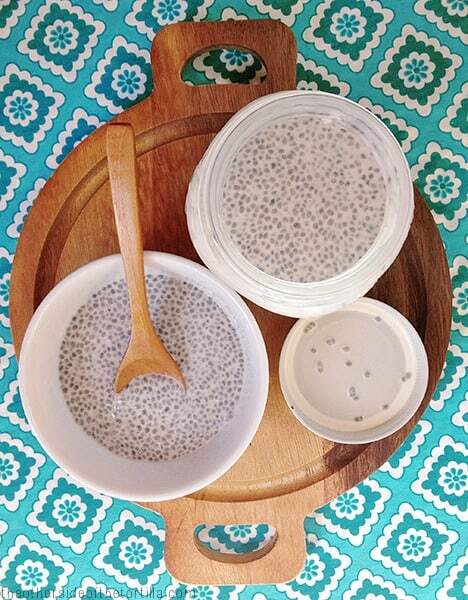 Add 5 tablespoons of chia seeds and 3 tablespoons of granulated pure cane sugar. Seal the lid to the jar tightly. 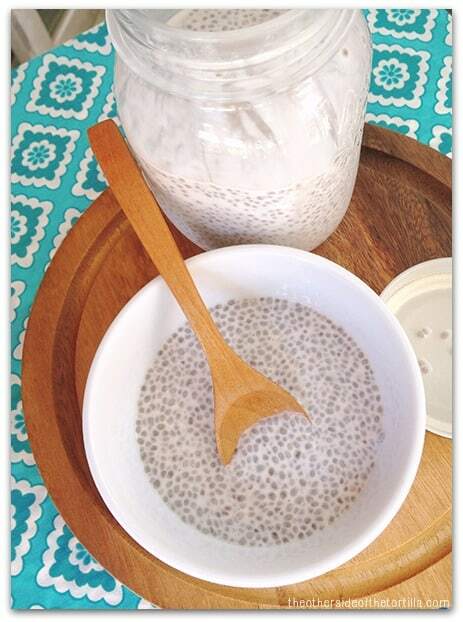 Shake gently for about 15 seconds to combine ingredients well and allow to sit on the counter for 20-30 minutes, until the chia seeds have developed a mucilaginous gel and absorbed some of the coconut milk. Shake gently and place in the refrigerator for a few hours. Serve chilled and garnish with shredded coconut (optional). This recipe will keep in the refrigerator for up to one week. Tip: I like to make this the night before and refrigerate overnight for a perfect texture the next day. Let the jar sit out for about 10 minutes before serving. Note about the sugar content: I don't use processed white sugar in my kitchen; if you do, you should halve the listed amount of sugar in the recipe and then increase to your liking. If you don't like your dessert to be too sweet or are closely watching how much sugar you consume, 3 tablespoons of granulated pure cane sugar should be plenty. But if you like things a little sweeter, increasing the amount of sugar to 4 tablespoons should be plenty to satiate your sweet tooth. You may also substitute agave nectar for the sugar, one tablespoon at a time until you reach desired sweetness. Yum. I love Chia Seed Pudding – I have a Vegan Triple Almond version on my site but make all kinds of variations. I do usually use almond milk thought but after seeing this, I think my next batch will be coconut! Awesome, Alyssa, I’m going to have to try your version! My aunt eats mostly vegan and I hate that she can’t eat a lot of my cooking, so I’ve been exploring more and more options in the kitchen that she can enjoy with us now that we live near her.